ArcGIS became a primary tool in assisting the effort to stay ahead of potential tree problems. GIS is helping FEC ask better questions, spot problem areas, and be proactive rather than reactive. The geocoding function of ArcGIS allowed FEC to capture history of problem trees. As bark beetles silently kill hundreds of thousands of acres of towering trees in the United States and Canada, Flathead Electric Cooperative (FEC) operators are growing concerned about what this means to its members in rural Montana. Dead trees along an electric distribution line represent a distinct fire hazard and power outage threat. In 2007, the US Forest Service blamed the beetles for killing 3.9 million acres of trees in Colorado, Idaho, Montana, Oregon, Utah, Washington, and Wyoming. Digitized lines are assigned a color to represent the year of the examination and tree trimming, with a label displaying the field with the service order number connected to it. "Our aim in general is to stay ahead of problem areas by keeping track of the trees that grow near utility equipment and lines," says Steve Quigley, vegetation supervisor at FEC. "Because of the beetle infestation, stretches of the electric distribution line that were previously clear of tree interference could become a concern. Here in our service area, the 'beetle kill' has been minimal compared to some of our neighbors to the north, such as British Columbia, Canada, and in the south, such as Helena and Deer Lodge National Forests." FEC serves more than 48,000 metered customers throughout northwest Montana, ranging from Glacier National Park just west of the Continental Divide to Libby, Montana, near the Idaho border. Since 1937, the utility has grown from a small group serving a handful of rural homes and farms to the largest co-op in Montana, with a diverse mix of rural and urban residential, commercial, and industrial members. Understandably, tracking tree health is a major concern for FEC. It is also a difficult endeavor. Much of FEC's 2,000 miles of overhead line runs through dense coniferous forests that provide limited access to field crews. Albeit a major threat, the bark beetle problem is just one of the many issues the right-of-way management department deals with using ArcGIS. Quigley joined FEC in 1999. Since then, he has recorded all vegetation management activities—from planning to completion—in a Microsoft Excel spreadsheet and on large paper maps. "The whole process was becoming very cumbersome and inefficient," Quigley says. "The spreadsheets have been a great method for storing the data, but it became apparent to me that there were better tools available, and technology had arrived that could also digitally preserve the information recorded on the paper maps." Quigley recognized the value of ArcGIS technology and the many ways it could most benefit the co-op. The opportunity to collaborate with Gayle Chvilicek, a member of the FEC GIS/Mapping Department, opened up possibilities to use the valuable information Quigley had collected. "It was the collection of data from the previous 10 years in the spreadsheet format that set the pattern for the fields within the feature classes," Chvilicek says. 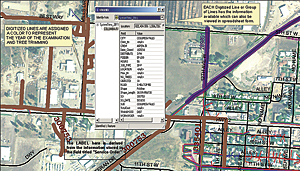 "This data and the format it was in worked fantastically with the geocoding function of the GIS software. It enabled us to capture the history of where problem trees had been and create a foundation from which to build the new feature classes." Since the company moved its vegetation management information to its GIS, there have been many benefits, including more accurate information of the service area and customer data. Quigley can now access that data, along with other useful tools, on a laptop. This saves time and travel, especially when work takes him to more remote areas for investigations and inspections. In the office, Quigley is able to create paper maps for tree crews with notes and comments to assist them. The Master Jobs feature classes show data for previous years and allow the utility to see what needs to be done, as well as what type of problem trees are in a particular area. The Outages feature class tracks outages caused by trees. An unusual number of outages in an area would serve as a flag to warrant further investigation. "These outages could be the result of many trees that have died and are beginning to topple into the line as a result of beetle infestation," Quigley says. "Many outages in an area caused by trees could also indicate that it is time to set up a system trim, possibly sooner than it was scheduled." 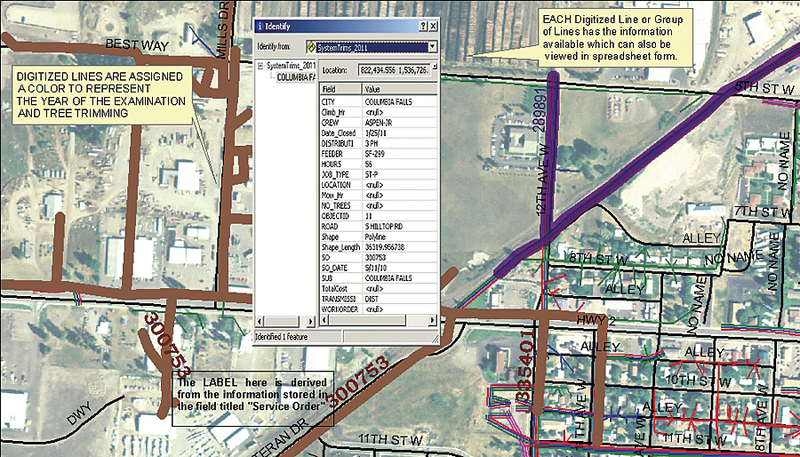 GIS allows the utility to identify patterns and detect problem areas. This helps direct tree crews to the most important needs first and, in many cases, take care of the situation before it becomes a costly problem. For more information, contact Gayle Chvilicek, GIS/Mapping Department, Flathead Electric Cooperative (e-mail: G.Chvilicek@flathead.coop).